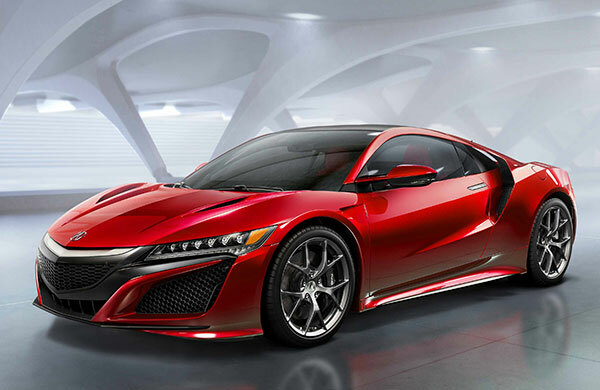 After three years of auto show teasers testing public response, Acura finally rolled out the production-ready version of the long-awaited NSX supercar at the 2015 North American International Auto Show in Detroit. Final shape, final interior, final powertrain. The exterior design has been refined several times since the first concept was unveiled at the 2012 Detroit show, the culmination of persistent rumors of a revival, even though production of the original ground to a halt in 2005 after a 15-year run. It’s not unfair to say that the first generation Acura NSX, a brilliant achievement at launch, eventually died of neglect. With the Acura division uncertain about its identity, pursuing development of a very low-volume exotic sports car became a very low management priority. But even though Acura officially abandoned the NSX, it was never completely forgotten, sustained by the engineers who had created it. So when the management climate thawed to the idea of a revival, the new development team, which was salted with some veterans from the first generation, wanted to make sure there was at least some continuity with the past. 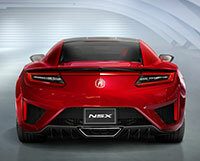 Thus, the new Acura NSX is a mid-engine two-seater, just like the original. However, that’s just about the only obvious parallel. The engine in the original NSX was a 3.0-liter V6 of rather modest output (270 horsepower), riding sideways behind the cockpit. NSX number two is a hyper hybrid, with a twin-turbo V6 mounted longitudinally amidships, and augmented by a trio of electric motors, one powering each front wheel, another grafted between the engine and transmission. The original NSX sent power to the rear wheels via a 6-speed manual transaxle. The generation two transmission is a 9-speed automatic, with manual shifting (via paddles) that can be race car quick, depending on operating mode. There are four: quiet (electric only), sport, sport+, and track. Total system output: more than 550 horsepower, according to Acura. Curb weight: Acura isn’t saying. The NSX’ s blend of carbon fiber, aluminum, high-strength steel, and composites is aimed at minimizing mass, but this is a substantially bigger car than the 3030-pound original, and we’ll be surprised if the new car weighs less than 3500 pounds. In terms of styling, the second generation NSX has evolved during each auto show display since its 2012 debut, each revision looking more wicked than the last. An LED light display highlights the production final front end, consistent with illumination on Acura’s RLX and TLX sedans, but the division’s beaky chrome grille theme has mercifully been left out of the design. The shape has also had extensive aero refinement, obvious at a glance, although Acura refrained from furnishing a coefficient of drag value or downforce numbers. At about $60,000 in 1990, the NSX was a bargain compared to the Ferrari 348. The second generation has all the hallmarks of a genuine supercar, and when it goes on sale in late 2015 it will wear a supercar price tag, in the mid-$150,000 range, according to a Nissan executive.